The intestinal tract's main functions are breakdown and absorption of nutrients, elimination of wastes, and immune response to foreign matter or microorganisms. It is easy to understand that blocking up the intestinal tract can cause a variety of symptoms. Constipation, low energy, obesity, poor resistance to infection, non-optimum immune response, and skin problems are signs the intestines need cleansing. Constipation will result in the reabsorption of toxins from wastes which are not moving through and out of the body promptly. Over time, waste materials build up along the walls of the small intestines, making it harder for nutrients to be fully absorbed into the blood. Less nutrition from your food and more toxins and waste in your bloodstream, do not make for a healthy body. This doesn't happen overnight, but many years of eating in a way that congests the gastrointestinal tract has a cumulative ill effect. There are different causes for constipation: the most common reasons include unhealthy diet choices, foods low in water content and fiber, a disturbed balance of intestinal flora or lack of the beneficial bacteria, stress, many medications, lack of exercise and not drinking enough water. Diet choices that are constipating include refined grains, flours and sugars, and all processed foods. This includes processed cereals and other breakfast foods, most sandwiches and desserts. Food-processing with heat, chemicals or pressure alters nutritional content generally rendering it indigestible or less digestible. Eggs, meats, fish and dairy are fiber-less proteins which are constipating and need help from high-water content fiber to make their way through the intestines. Fresh vegetables and fruits should have a high priority in any diet to provide plenty of water content, fiber and nutrients which are available to the body. Another top cause of constipation is having not enough beneficial bacteria (intestinal flora) in the gut to help break down foods, regulate peristalsis and soften stools. An imbalance in intestinal bacteria can lead to a sluggish bowel. Beneficial gut bacteria is destroyed by chlorine in drinking water and showers, as well as by antibiotics, pollution and stress, making it vital to replenish them. Probiotic supplements are a fast way to replace friendly bacteria. Natural fermented and cultures foods can also help maintain a healthy balance of beneficial bacteria. Medications such as certain painkillers, antidepressants, and antacids can also tend to constipation. Substances like opioid painkillers slow down peristalsis, which hardens stools. This allows food in the gut to stagnate and eventually ferment as it waits to be moved through the intestines. Harmful bacteria have more of a chance to take root in an unhealthy blocked system leading to constipation and other disorders. These constipation culprits can take time to reverse on their own. 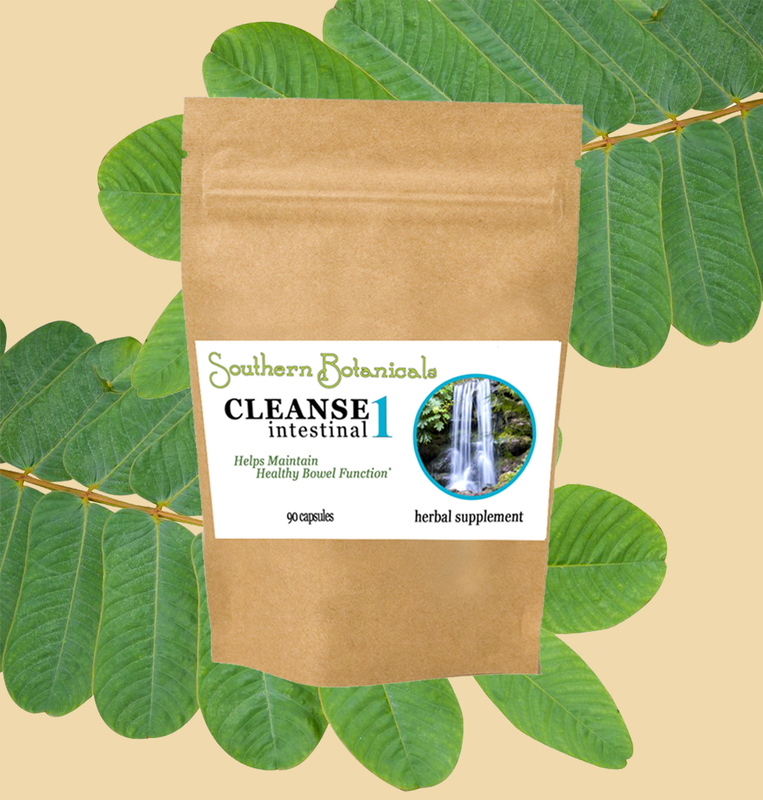 Intestinal Cleanse 1 can be taken periodically as needed to clear build up. It keeps the bowels open while you bridge the gap between old and new health habits that deal directly with the causes of the slow or blockage. When regularity is restored to the intestines and wastes are moved out, energy increases, skin problems begin to clear up, and headaches caused by backed up waste in the body are relieved. Giving the body a chance to comfortably remove old poisonous toxins allows healing to begin on any damaged tissue. Since the intestinal tract is connected to other major organs and systems of the body, its health affects surrounding organs. Cleansing the intestinal tract can help boost the entire digestive system as a whole and connected organs. This is one reason we use whole plant parts to make our herbal formula, not just standardized herbal extracts for isolated specific effects. These herbs also have mild anti-viral, anti-bacterial, and antifungal properties that neutralize invaders in the digestive tract. As harmful bacteria are removed from the intestines, healthy bacteria have a chance to replenish, restoring natural balance and vitality to the body. NOTE: Intestinal Cleanse 1 stimulates peristaltic waves, helping the digestive system to expel waste. A little gas may be released from the loosened toxins, in which case taking a few Intestinal Cleanse 2 capsules will absorb the gas and loosened acids, and relieve this. For irritated conditions of the intestines with loose stools, do not use Intestinal Cleanse 1. In this case, Intestinal Cleanse 2 is recommended for use instead. Loose liquid evacuations are soothed and regulated by the herbs and natural absorptive ingredients in Intestinal Cleanse 2, making it a more appropriate choice. Note on Constipation in Pregnant Women and Intestinal Cleanse 1: Any types of laxatives, herbal or otherwise, are not recommended for the treatment of constipation during pregnancy because they can stimulate uterine contractions. We recommend you consult with your doctor to find a solution. Iron supplements may be a cause of constipation. See what others have to say about their Success using Intestinal Cleanse 1. Intestinal Cleanse 1 can be used alone or it can be combined with the fiber of Intestinal Cleanse 2 at different times of day to absorb acid wastes that are moving through the digestive system and carry them safely away, soothing the inner lining all the way through. Intestinal Cleanse 2 will absorb and draw out toxins, poisons, drug residues and heavy metals such as mercury and lead.